The Zest Straight Knife Cloth Cutting Machine from Linz has been successfully used throughout Britain's textile & clothing industry for over 40 years. The current MKII-C (MK2C) model: features a proven well tested design and is precision manufactured to produce a versatile general purpose straight knife cloth cutting machine, suitable for use on many different types of fabric. The low profile base plate and narrow cutting standard, coupled with a powerful 1/2 Hp Motor and built in quick blade sharpener, combine together so users can easily cut multiple ply cloth lays with the minimum of effort. The Zest is highly manoeuvrable and suited to cutting the varied shapes associated with clothing and textiles. In addition to the standard features expected from today's modern cloth cutting machines, the Zest is fitted with its own self contained oiling system, and where practical, important moving parts are manufactured from special patented oil-less metals which reduce servicing costs and increase reliability. Manufactured to the highest standards in Japan. Zest machines are built to last and with correct use and care they can give you many years of service. 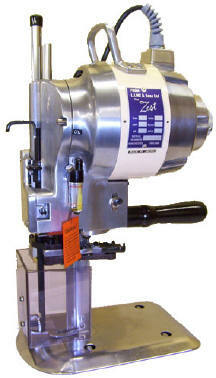 Linz Zest machines have been manufactured, refined and improved for over 40 years. and the built in blade sharpener uses simple inexpensive abrasive bands. Spare parts cutting blades and emery bands for existing zest cloth cutting machines available from our spares dept. *subject to stock availability.